This Arkansas cluster is so bright and shiny that the photos overdosed! 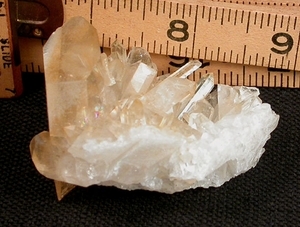 Yellow and white crystals, with the main two, fleabites to 1/16" noted, more towards tangerine. The sparkling bi-level plate bottom, pure white. Plenty of rainbows and record keepers on this miniature-sized group of 1-7/8x 2-1/4x 1-3/4" sitting up. The uncommon 8-edged channel faced Main point, very penetrated, is 5/8x 1-3/4". Collier Creek Mine.